Watching the news can make one feel discouraged and hopeless about the state of the world, with increasing violence around the world and in our own neighborhoods. 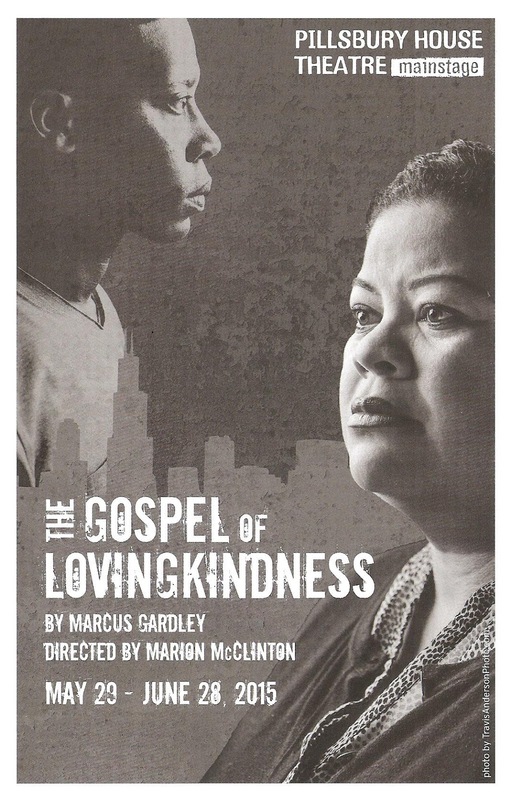 At Pillsbury House Theatre, they're trying to make some sense of it and provide a bit of hope by preaching The Gospel of Lovingkindness, a new play by Marcus Gardley. It's beautifully and poetically written, full of life and humor that balances out the devastation and death of the situation. It's heavy, and not easy to watch at times, but so worthwhile and necessary. The Gospel of Lovingkindness is one of those plays that is about so much more than theater. Through a series of monologues and two-person dialogues, we get to know a smart and talented young man named Emmanuel, who sang at President Obama's inauguration shortly before he was shot and killed in his neighborhood on the South Side of Chicago. Although fictional*, it's a story that's all too familiar. Emmanuel's mother is, of course, devastated by the loss of her only son, but after an encounter with the ghost of civil rights activist Ida B. Wells, still wandering the streets of Chicago, she turns her grief into action. She organizes others in her community and goes on local talk shows to promote a world free from violence. It feels like an endless and fruitless struggle, but Mary never gives up, and I believe she'll succeed. Three of the four members of this terrific four-person cast play multiple characters, but Thomasina Petrus has only one role, Mary, and she's the center and soul of the play. Her performance of a grieving mother is a thing of breathtaking, gut-wrenching, and almost unbearably painful beauty. She portrays a grief that's tragically universal but also utterly specific. I couldn't help but think of my grandmother, who lost her 17-year-old son not to a stray bullet but to a speeding train in the cold dark January night. She once said that she lived through the worst thing that could happen, so everything else is bearable. The strength of mothers is astounding, and this mother turns her personal tragedy into tireless work to ensure a world where no mother has to go through the pain that she did. 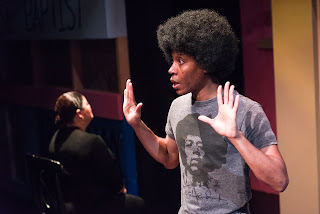 Supporting Thomasina and playing all of the other characters in Mary's life are Namir Smallwood (charming as the bright young Emmanuel with an afro like "a young Michael Jackson," and heartbreaking as another young man whose future is not as bright), Aimee K. Bryant (excellent in multiple roles including the funny best friend, a sympathetic cop, Ida B. Wells, and another struggling mother), and James A. Williams (also excellent as Emmanuel's father, coach, boss, and a closed-minded politician). This play, although by no means a "musical," incorporates music in a beautifully simple way. The play opens with Emmanual singing the simply stirring "Ave Maria," later Mary sings her son to sleep in perhaps the most moving scene in the play, and Ida B. Wells sings about a love of the city these characters call home in "Sweet Home Chicago" (when you have voices like Thomasina's and Aimee's at your disposal, use them!). 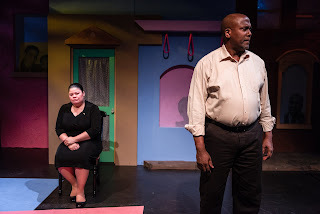 Marcus Gardley's work was last seen on the Pillsbury House stage in the road weeps, the well runs dry. 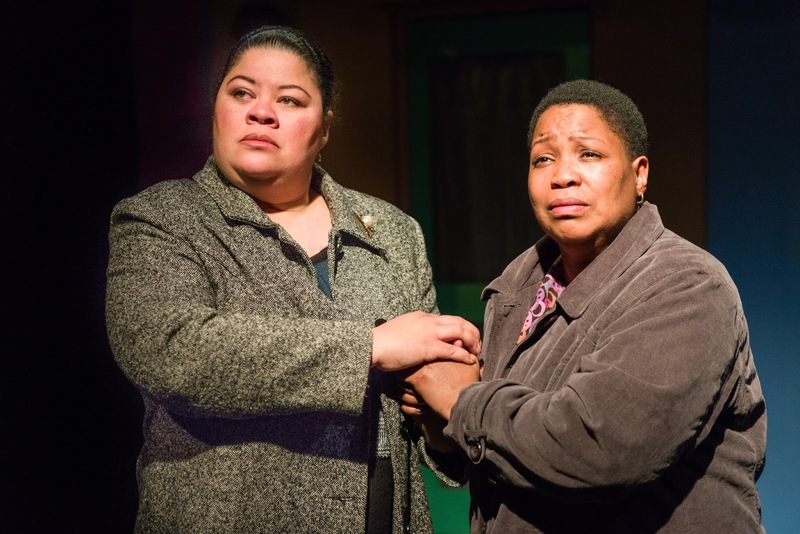 This play is less epic in scope, but perhaps more epic in meaning, relevance, and urgency. It doesn't offer easy answers, because there are none, but it does offer a beacon of hope, if we all look at the problem of violence, talk about it, and work together for solutions. 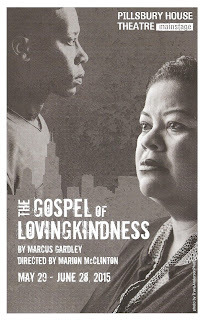 The moving, heart-breaking, inspiring, and beautifully executed play The Gospel of Lovingkiness continues through June 28. *The play is inspired by the life and death of 15-year-old Hadiya Pendelton, shot in the back on the South Side of Chicago in 2013. Her parents have started a foundation in her name, and this Tuesday June 2, what would have been Hadiya's 18th birthday, you can show your support of a world without gun violence by wearing orange. Here in Minnesota, check out Protect MN and their upcoming music/theater benefit to end gun violence.